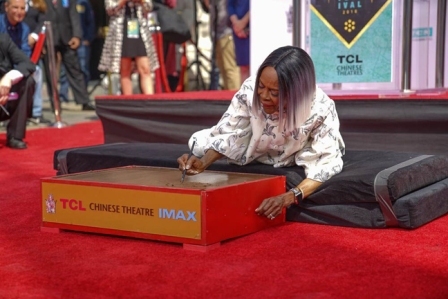 Cicely Tyson, an Emmy and Tony Award winner, was honored by Turner Classic Movies (TCM) on Friday, April 27 at the TCL Chinese Theatre with a hand and footprint ceremony. Tyson was recognized for her more than sixty-year career within the entertainment industry. 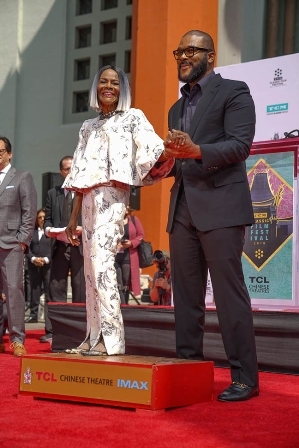 Tyler Perry, renowned filmmaker, paid tribute to the actress before the ceremony. Perry casted Tyson in 2005 for his movie Diary of a Mad Black Woman. “I remember being a little boy watching her. It was such a profound moment to see a woman with grace, class and strength,” said Perry. “Even now I remember watching President Obama put the Presidential Medal of Freedom around her neck. To see her legacy immortalized in this concrete is amazing,” continued Perry. Tyson’s legacy also includes her activism for promoting the arts. The Cicely Tyson School of Performing and Fine Arts in East Orange, New Jersey promotes artistic culture for students between sixth and twelfth grade. Tyson credits a majority of her success from the strength of her family. She spoke about why her family still lives through her in spirit. “I also want to address the people who could not be here. I’m the sole surviving member of my entire family and obviously I’m here for a reason. There spirit is still here with me. My parents and everyone are all with me today,” said Tyson. Her most recent work includes roles in How to Get Away with Murder and Netflix’s political drama House of Cards. 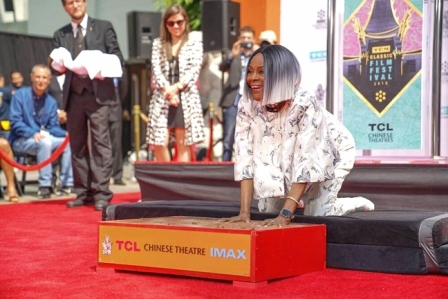 Other Hollywood legends handprints are immortalized in front of the TCL Chinese Theatre. Icons such as Will Smith, Elizabeth Taylor, and Marilyn Monroe are just a few of the notable names.